In this article I'll discuss the most fundamental technique in concurrent programming known as memory barriers, or fences, that make the memory state within a processor visible to other processors. CPUs have employed many techniques to try and accommodate the fact that CPU execution unit performance has greatly outpaced main memory performance. In my “Write Combining” article I touched on just one of these techniques. The most common technique employed by CPUs to hide memory latency is to pipeline instructions and then spend significant effort, and resource, on trying to re-order these pipelines to minimise stalls related to cache misses. When a program is executed it does not matter if its instructions are re-ordered provided the same end result is achieved. For example, within a loop it does not matter when the loop counter is updated if no operation within the loop uses it. The compiler and CPU are free to re-order the instructions to best utilise the CPU provided it is updated by the time the next iteration is about to commence. Also over the execution of a loop this variable may be stored in a register and never pushed out to cache or main memory, thus it is never visible to another CPU. CPU cores contain multiple execution units. For example, a modern Intel CPU contains 6 execution units which can do a combination of arithmetic, conditional logic, and memory manipulation. Each execution unit can do some combination of these tasks. These execution units operate in parallel allowing instructions to be executed in parallel. This introduces another level of non-determinism to program order if it was observed from another CPU. Finally, when a cache-miss occurs, a modern CPU can make an assumption on the results of a memory load and continue executing based on this assumption until the load returns the actual data. Provided “program order” is preserved the CPU, and compiler, are free to do whatever they see fit to improve performance. Loads and stores to the caches and main memory are buffered and re-ordered using the load, store, and write-combining buffers. These buffers are associative queues that allow fast lookup. This lookup is necessary when a later load needs to read the value of a previous store that has not yet reached the cache. Figure 1 above depicts a simplified view of a modern multi-core CPU. 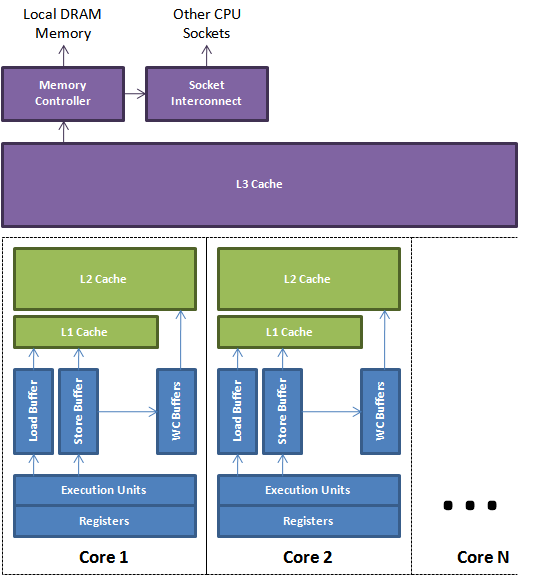 It shows how the execution units can use the local registers and buffers to manage memory while it is being transferred back and forth from the cache sub-system. In a multi-threaded environment techniques need to be employed for making program results visible in a timely manner. I will not cover cache coherence in this article. Just assume that once memory has been pushed to the cache then a protocol of messages will occur to ensure all caches are coherent for any shared data. The techniques for making memory visible from a processor core are known as memory barriers or fences. Memory barriers provide two properties. Firstly, they preserve externally visible program order by ensuring all instructions either side of the barrier appear in the correct program order if observed from another CPU and, secondly, they make the memory visible by ensuring the data is propagated to the cache sub-system. Memory barriers are a complex subject. They are implemented very differently across CPU architectures. At one end of the spectrum there is a relatively strong memory model on Intel CPUs that is more simple than say the weak and complex memory model on a DEC Alpha with its partitioned caches in addition to cache layers. Since x86 CPUs are the most common for multi-threaded programming I’ll try and simplify to this level. A store barrier, “sfence” instruction on x86, waits for all store instructions prior to the barrier to be written from the store buffer to the L1 cache for the CPU on which it is issued. This will make the program state visible to other CPUs so they can act on it if necessary. A good example of this in action is the following simplified code from the BatchEventProcessor in the Disruptor. When the sequence is updated other consumers and producers know how far this consumer has progressed and thus can take appropriate action. All previous updates to memory that happened before the barrier are now visible. // store barrier inserted here !!! A load barrier, “lfence” instruction on x86, ensures all load instructions after the barrier to happen after the barrier and then wait on the load buffer to drain for the issuing CPU. This makes program state exposed from other CPUs visible to this CPU before making further progress. A good example of this is when the BatchEventProcessor sequence referenced above is read by producers, or consumers, in the corresponding barriers of the Disruptor. A full barrier, "mfence" instruction on x86, is a composite of both load and store barriers happening on a CPU. In the Java Memory Model a volatile field has a store barrier before the write, and full barrier after the write to it, this is paired with and a load barrier inserted after a read of it. Qualified final fields of a class have a store barrier inserted after their initialisation to ensure these fields are visible once the constructor completes when a reference to the object is available. A JVM does not have to issue specific instructions, such as sfence, it can use other techniques to achieve the same behaviour provided by the processor architecture and compiler blend. Atomic instructions, such as the “lock ...” instructions on x86, are effectively a full barrier as they lock the memory sub-system to perform an operation and have guaranteed total order, even across CPUs. Software locks usually employ memory barriers, or atomic instructions, to achieve visibility and preserve program order. Memory barriers prevent a CPU from performing a lot of techniques to hide memory latency therefore they have a significant performance cost which must be considered. To achieve maximum performance it is best to model the problem so the processor can do units of work, then have all the necessary memory barriers occur on the boundaries of these work units. Taking this approach allows the processor to optimise the units of work without restriction. There is an advantage to grouping necessary memory barriers in that buffers flushed after the first one will be less costly because no work will be under way to refill them. I read the artical serval times but I still feel I didn't fully understand when we need a memory barrier. Let's take simple example (single reader single writer circular buffer), can you please help me identify where and why we need memory barriers? //W1 to make sure we get the latest value of variable "read"? //W2 to make sure that the value in buffer[write & N] is seen by reader before the variable "write" is updated? //W3 to make the variable "write" observable by reader? On x64 you need an mfence after, or better still do a "lock addq" on, the read and write variables when incrementing. That is at point W3 and R3 in your code. Note R3 needs to be a mfence or sfence and not a lfence. You need this because you want to ensure the "produce(buffer[write & N])" happens before updating the counter to make it visible. By the way N needs to be N - 1 for the mask to work in your code. If you are on a weaker memory model than x64 you would need a load barrier at W1 and R1. "You need this because you want to ensure the "produce(buffer[write & N])" happens before updating the counter to make it visible." Are you talking about mem barrier at W2 and R2? You need W3, don't need W2, on the producer side to make both the production of the item in the buffer and the write sequence increment visible in the correct order. You need the R3 to be a store barrier to ensure the producer can see the progress of the consumer without over running it. W2 and R2 are not needed on any architecture. W1 and R1 might be needed as load barriers on some architectures. I don't understand why W2 wouldn't be necessary in Xin Wang's above. My understanding is (and it could very well be wrong) that the sfence instruction makes store instructions preceding the sfence globally visible before store instructions that follow the sfence. In Xin's example, we have to be sure that the produced data is globally visible before the incremented counter is visible. If we don't put an sfence between these stores, isn't there a risk that the reader is seeing the incremented counter before the new data in the buffer? Putting the fence after counter is incremented only makes sure that the counter is visible before any stores following the counter increment, but that is not really what we need here. You are correct, my mistake. It should be noted that on x86_64 there is no need for a hardware memory barrier at all because the code respects the Single Writer Principle. Other platforms are different! * Load a sequence and ensure instructions after, happen after. * Store a sequence and ensure previous stores, happen before. The release_store options are just memory stores if you look at the code. Depending on what compiler and setting are used this may be an issue. The XCHG(implicit lock instruction) is not used in the release_store methods in the linked file. The store_release will simply generate a MOV instruction which is sufficient for the hardware memory model. The ASM example I give above is a directive to GCC to not reorder the code. To ensure "produce(buffer(write & (N-1))" happens before the updated counter is visible, shouldn't we insert a store barrier between producer() and ++write? Can you please recommend some articles or books if I want to learn the memory model/memory barrier? It is not necessary to have a memory barrier on every line. Memory barriers are used to create reference points when you can determine an order. The memory model is different for most CPUs. The link below is for the Intel x64 processors which is one of the more simple to understand. Others such as the Dec Alpha, on which the Linux memory model is based, are much more complicated. The more complex models are usually a super set of the less complex models. The CPU manufactures publish their memory models so compiler writers can understand them. "You need this because you want to ensure the "produce(buffer[write & N])" happens before updating the counter to make it visible. By the way N needs to be N - 1 for the mask to work in your code." I have spent quote some time reading Intel x86 documentation and but a bit confused. Because of all guarantee that Intel x86 gives us I don't see applicability of sfence except for the case to prevent reordering loads with older stores. You are correct in that a fence is not required on x86 if you are sure a variable only has a single writer. It is required if you have multiple writers. This is because the store buffer needs flushed so you see the latest value and not your own last write. Other processors don't have such a strong memory model, e.g. ARM, MIPS and ALPHA. From Java you have limited options to make sure a variable is not register allocated. If it is register allocated in a loop, then it may not be made visible. To get around this the variable needs to be declared volatile, therefore generating a lock instruction with a fence. There is a trick that works with Atomic*.lazySet() but this is not officially defined in the Java memory model. My understanding is that the Atomic*.lazySet() only prevents a variable from being register allocated and does not use a fence. Is it correct? Atomic*.lazySet() not only prevents the variable being register allocated it also imposing ordering. This ordering is only at a software level as there is no explicit hardware fence. If you follow the code down into unsafe it calls putOrdered*(). as you said above about multiple writers,only the barrier-w3 can ensure "buffer[write & N])" and "++write" be executed in a atomic way? I think the 2 lines are in a Critical Section. The above algorithm will only work with single producer and single consumer. Multiple writers of the "++write" would result in a corrupt sequence. Does the barrier just work on a specific field(by volatile modifier), or all the memory in cache? So it says here it can only guarantee the visibility of the volatile fields. Also I'm reading the white paper of Distruptor, it seems it just rely on the ProducerBarrier and ConsumerBarrier to guarantee the visibility on ValueEntry. Just wonder if my understanding to the description in javadoc is wrong, or this is an implementation specific behavior of oracle jdk. The barrier is associated with release and subsequent acquire of a specific field. What this means is that when you write the volatile field then all writes before that write in program order are visible to any thread that observes the write when they read the field. This is defined in the Java Memory Model for all JVM from Java 5 onwards. Fantastic article! I have read a few of your articles. They are high quality and great for learning about low level architectures. Hi, thank you for this article. I think you succeed to explain simply these complex things. It reminded me some details I forgot because I don't use them in my daily work. Really enjoy your articles Martin. What is the cost associated with a sfence instruction? The reason I am asking is because I try to make most of my objects immutable, i.e. final fields. But if there is a performance penalty and the object is not published to multiple threads, does it make more sense to make these fields non-final? I realize this would be a micro-optimization, but for certain system every nano-second counts. On x86 no hardware fence is required for final fields. The x86 memory model is Total Store Order (TSO) and provided the compiler does not reorder the stores then no fence is required. Use your final fields without any performance worries! Thanks for the reply Martin. Can you explain what you mean when you say this then? "Qualified final fields of a class have a store barrier inserted after their initialisation to ensure these fields are visible once the constructor completes when a reference to the object is available." Is this only when the compiler reorders the stores? If a processor is not TSO, e.g. ARM, then a hardware fence is required. On x86 no hardware fence is required because it is TSO. However the compiler requires a software fence to ensure ordering is preserved of the stores. If you are on x86 their is no performance penalty. Thanks for this nice article. I have a question. Why do we need a load barrier if the store barrier alone exposes the data to the cache subsystem, and "cache coherence" makes sure the data is synchronized between different CPUs ? // Sore barrier. Flush store buffer. // Load barrier. Why do I need a Load barrier if the store barrier above makes sure the cache is up to date? Say you wanted to read value in a loop and always get the latest value, or you want a load to be ordered before other loads? The author says: "Barriers 1 and 4 prevent this example from writing “0”. Barriers 2 and 3 provide a freshness guarantee: they ensure that if B ran after A, reading _complete would evaluate to true." These are full barriers. I understand that Barrier 1 and 4 are needed for order, that is to make sure that answer is written to before _complete. While barrier 4 ensures that the read from _complete happens-before the read from _answer. Now I don't understand why both Barrier 2 and 3 are needed. Isn't one of them enough ? Let's say barrier 2 flushes the store buffer, then barrier 3 is redundant. Barrier 2 is required for sequential consistency which can be achieved by waiting on the store buffer to drain. If B() was called in a loop then barrier 3 prevents the read of _complete being hoisted outside the loop which would be possible after inlining. I understand that for a loop Barrier 3 is needed, but there is no loop in B(). Assuming there is no loop, is barrier 3 necessary? My guess and I could be wrong is that cache coherency is not atomic and there is a delay because there exists a queue for cache delivery between CPUs. When the store buffer is flushed out in Barrier 2, _complete will be present in that CPU cache only, but it is not immediately present for the other CPU cache running B(). So Barrier 3 will flush the caching queue. Is this possible ? You cannot make any assumptions regarding the context in which B() will be called if you designed it as a library. I do not believe Barrier 3 is about flushing caching queues. Barriers/fences are for ordering and not flushing queues/buffers. Barrier 3 ensures the load of _complete is not ordered back in the stream from its intended position. "A store barrier will flush the store buffer, ensuring all writes have been applied to that CPU's cache. A read barrier will flush the invalidation queue, thus ensuring that all writes by other CPUs become visible to the flushing CPU." The Wikipedia article is generic. It is not necessary to implement invalidate queues for MESI, and x86 does not. If you look at what x86 assembly instructions get generated for a volatile load in Java you will see it is just a simple MOV instruction. For the normal write back memory, to achieve sequential consistency, x86 only needs a fence for preventing younger loads passing older stores due to the store buffer. We have far more need for soft fences to prevent compiler re-orderings. "The Wikipedia article is generic. It is not necessary to implement invalidate queues for MESI, and x86 does not." This code may not run on x86. What if it runs on a CPU that implements invalidate queues. It's safe to have a barrier then. If you write code in a language that has a memory model, then the compiler will generate the appropriate ordering instructions for the processor it runs on. For example a Java load of a volatile field on x86 is just a simple MOV instruction but on other processors, such as Power and ARM, it has to generate additional fences. You don't change the code you write in Java. For example, a volatile on Intel x86 is only a hint for the JIT not to optimize the variable since Intel x86 has a strong memory model (with the exception of write-read reorder). Anyway, the store buffer is still an issue even on x86. My understanding of the .Net Memory Model is that it is stronger than the Java Memory Model, particularly for field access - writes to a field have StoreStore ordering. BTW volatile is not a "hint" to JIT. The interpreter, and code generated by the JIT complier, must produce in very specific behaviour for this synchronising action. In general, memory barriers are way more significant to the compiler optimisation than the hardware. By "hint to JIT", I mean the CPU does not do anything with the volatile keyword. It's the JIT interpreter that needs to generate instructions, fences, etc. I feel that i need to start from the basis to understand these concepts and use it in the right way while programming! Do you suggest a good approach or sequence of lectures to master the JMM concepts (from the high level POWs of volatile,atomics etc to the low level of memory barriers...)? I hope that it wouldn't be necessary to simply memorized all the "rules" but that exist a logic thought that could be applied to deduce all the expected behaviours of the compiler (at least)! There is a lot to learn. To help I offer courses on this subject. Excellent article. Thank you for sharing. I have one question though. I was looking at Intel's IA manual and it mentioned that the CMPXCHG8B Instruction (Compare and Exchange) Instruction is implicitly locked. "CMPXCHG8B Instruction. The compare-and-exchange 8 bytes (64 bits) instruction is supported (implicitly locked and atomic)." If its implicitly locked, then why would Java translate Atomic instructions to prefixed LOCK, as mentioned in your article? Please let me know if I am missing something or if my understanding is not correct. The LOCK prefix is implicit on some instructions, when added it makes no difference but it does clarify the ASM output for those that read it. I think I understand the acquire/release semantics of memory barriers and the fact that they can create a happens-before relationship. However, I am having trouble understanding how visibility kicks in. For example if we take the beginning of Dekker's algorithm and add a memory barrier, is it guaranteed that only a single thread will win? From my understanding, the memory barrier does not guarantee that the second thread will be able to read the "fresh" value that the first thread wrote. However, *if* it sees it, it will also see all the previous stores. Memory barriers are about providing sequential consistency and not about what version of a value is seen. The memory barrier prevents the re-ordering of "b" with the store of "a" on thread A, and vice versa on thread B. The full Dekker's algorithm also requires a "turn". Should not a store barrier be inserted before a write instruction and a load-barrier after a read instruction? In original case, if a store barrier is inserted after the write then it does not prevent all the instructions before that barrier to reorder among themselves and similar argument for load instructions after the load-barrier. in other words the less the use of memory barriers the faster the program. I bet Agrona, JCTools, Disruptor, Aeron any derivative were built with such principles in mind. Thanks for publishing deep and comprehensive knowledge on such low level, otherwise unknown, issues. "A store barrier, “sfence” instruction on x86, waits for all store instructions prior to the barrier to be written from the store buffer to the L1 cache for the CPU on which it is issued. This will make the program state visible to other CPUs so they can act on it if necessary." The L3 cache can snoop into the private L1/L2 caches to fetch a copy of a modified cache line. You can read up on how MESI+F is implemented for Intel caches. I'm still puzzled by one thing. In a multicore CPU, how would memory barriers work ? For an example as you've stated, SFENCE would make sure that all store instruction prior to the barrier would be put in the L1 cache. But my understanding is that cache coherency is not instantaneous and it may take couple of cycles for that to to be globally visible. Am I right on this ? If I am then how would using SFENCE make sure of happens before contract in Java volatile ?